ACS Electrical are an NIC EIC registered company. We specialize in offering a professional service covering all aspects of electrical installation work including fault finding, inspections and testing. Our vision is simple, to continue to provide the best quality electrical installations. These will be undertaken by experienced responsive staff, who will endeavour to further enhance our reputation of reliability, professionalism and quality that has enabled the company to continue to succeed. Every effort will be made to provide our services competitively without detriment to quality and on schedule. 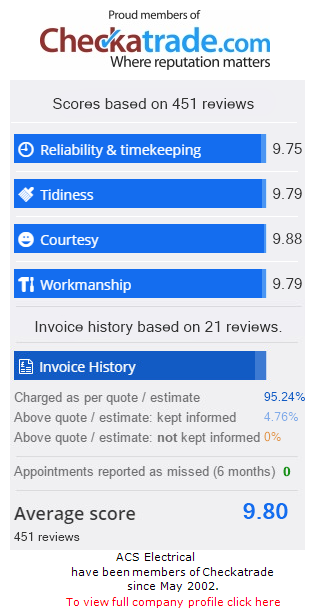 These qualities of reliability and professionalism translate into a high level of excellence and trust, trademarks that have carried our reputation for over 20 years throughout Sussex. ACS Electrical are NIC EIC registered and offer a professional service covering all aspects of electrical work. "First time I have used them (ACS Electrical) and I am delighted with their work and courtesy." Fitted new ceiling lights, fans. Plug sockets and switches. Plus repairs. “Excellent service. Prompt and reliable. All work carried out within agreed time scale and completed properly. Professional and friendly company that I would be happy to recommend”. ACS is the main electrical contractor to the retirement home. “We cannot speak too highly of ACS Electrical. We would be happy to recommend them to others”. Investigate earth fault on lighting circuit and rectify. “A very difficult problem to identify but resolved very professionally and treated as urgent. Would certainly recommend”. Restore electrical supply to property. “I would recommend this firm to anyone with complete confidence. I have used them before and will again”. "Fantastic, clean and tidy. They are methodical, very helpful and always on time. I would recommend them and use them again for future work." "My water wasn't heating and I needing it fixing as soon as possible as I have a full diary of dogs to wash! Anthony Bull was considerate, helpful and quick! I'm back on the road, thank you." "Methodical, courteous, tidy and patient with my total ignorance! ACS Electrical come highly recommended." Investigate fault in external supplies. “All external supplies checked, problem identified to a faulty appliance and isolated. Rechecked and left in working order. Very efficient and thorough”.